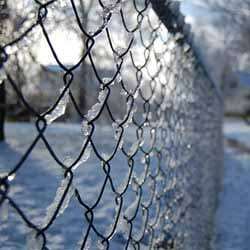 Chain link fences are an old standby for swimming pools, security fences, tennis courts, and enclosures for animals. Choose galvanized (silver) or green-coated material. Pipe is available in a variety of gauges to suit your needs. We specialize in residential and commercial installations. For industrial-quality security, we offer high-gauge chain link fence up to 10 feet high. GAUGE: from 11.5 (thinnest gauge, least expensive) to 9 (thickest, more expensive). Contact us by phone or email for a price quote on sections and/or installation!